When Jimi Hendrix suddenly died in London on September 18, 1970, his father James “Al” Hendrix barely had the money to bring his body home. Among the fans attending the Seattle funeral were Miles Davis, Johnny Winter, and drummer Buddy Miles. In 1995, Al Hendrix finally regained control of Jimi’s music with the help of Microsoft billionaire Paul Allen, founder of the Seattle Experience Music Project and owner of the largest collection of Hendrix memorabilia in the world. With these new funds, the senior Hendrix bought a 54-plot space in Greenwood and had plans drawn up for a suitable monument to his son. Unfortunately, he didn’t survive to see it completed. Sundial and one of the portraits, with family headstones surrounding the outside. The monument, designed by architect Mark Barthelemy of Cold Springs, is a granite-capped gazebo. 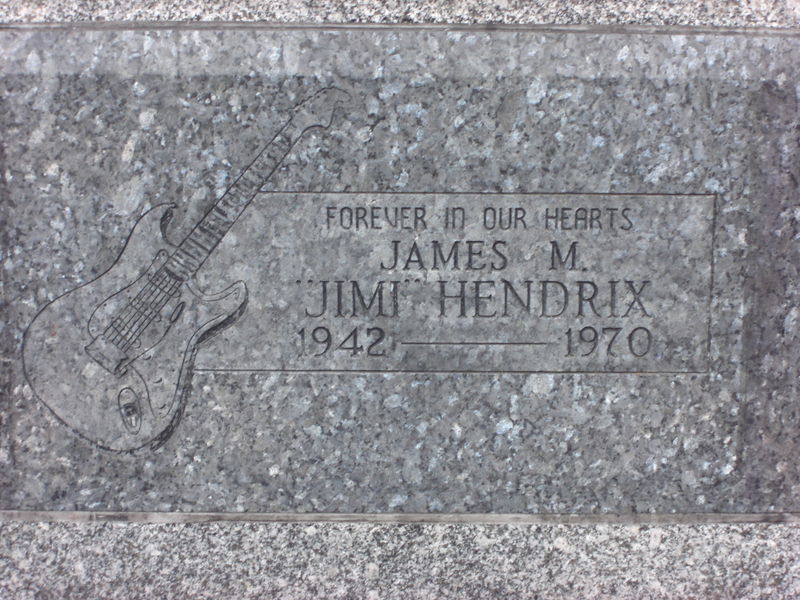 Each of its three supporting pillars features a laser-etched portrait of Hendrix and some of his lyrics in his handwriting. The breathtaking monument is handicap-accessible. 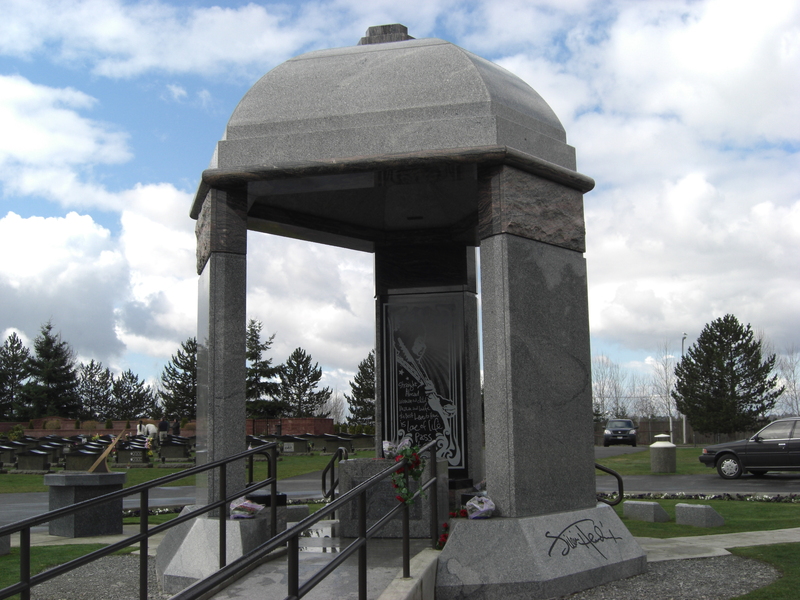 On November 26, 2002 (the day before his 60th birthday), Jimi Hendrix was exhumed and reburied with his father in a vault beneath the new monument. His original headstone, newly restored, was encased in granite in the center of the memorial. His original burial site was then marked with a simple bronze placeholder. Up to 15,000 fans visit Hendrix’s grave each year. Before Hendrix was moved, fans trampled adjacent graves and caused some damage. Now they leave flowers, lipstick kisses, and drug paraphernalia. Greenwood follows the memorial park style in that it is a large, flat green plain. Highlights include a modern carillon, a Veterans of Foreign Wars monument, crowned with an anti-aircraft gun, and the Garden of Eternal Peace, which features a large pagoda and a fountain surrounded by large carp. Hendrix’s tomb is easy to see when you enter the graveyard. 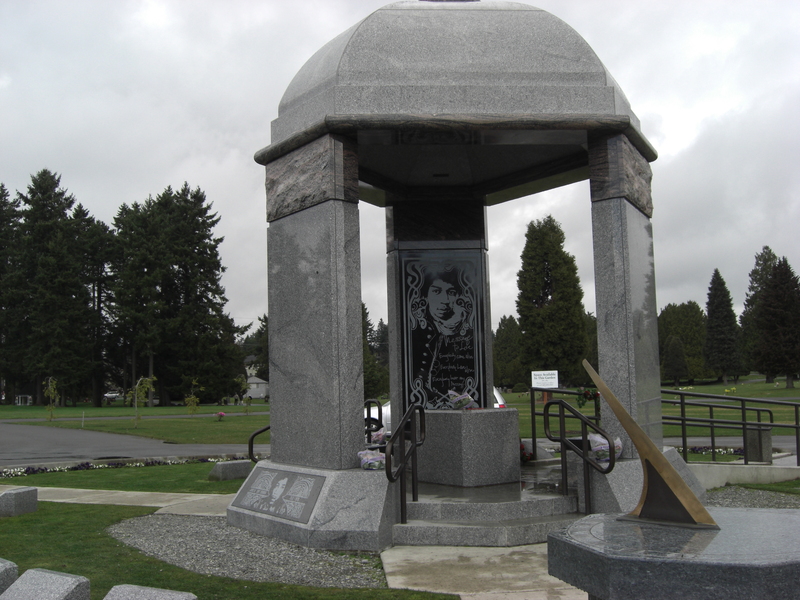 This entry was posted in Cemetery of the Week and tagged Black History, Black History Month, Greenwood Memorial Park, Jimi Hendrix's grave, Seattle cemetery, Washington cemeteries. Bookmark the permalink. We didn’t think to bring anything, but he was a huge influence on my husband, who’s a guitar player. I don’t think any of my photos here show how many bouquets had been left around the monument.